Well, it’s that time of year where our students turn into little ghost, goblins, witches, princesses, superheroes, and more! Halloween is an exciting time of year for our little shape shifters and it can be a fun time of year to get some great creative writing out of your students. It’s important for us to use our students’ excitement whenever we can and Halloween is for sure a time of great excitement! While we can incorporate Halloween in several ways, below are 7 great ways to add some spooky writing into your classroom this October! Poetry can be very difficult to get students into but when you add something they’re interested in into the cauldron, it can be magical. Have students tell you what they are going to be for Halloween. Then, print out an outline of each of your students’ chosen characters and have them write a poem from that “person’s” perspective. For example, if someone is going to be a firefighter, they might write a poem about putting out a fire or if they are going to be Elsa from Frozen, they might write a poem about being misunderstood. Then have the students write their poems inside the characters, cut them out, back them with some sweet construction paper and hang them on the wall for some new room decorations. Sticking with the poetry theme, you can also have students write out an acrostic poem. This poem can spell out whatever their costume is going to be this year or it can be something Halloween related. This is a great way to talk to students about theme. In addition, it helps them really think about their word choice because there are only certain words they will be able to use depending on the word they have chosen. Persuasive writing is a fun way to get students writing. An engaging activity for the Halloween season is to have students design their own monster, and then try and sell it. 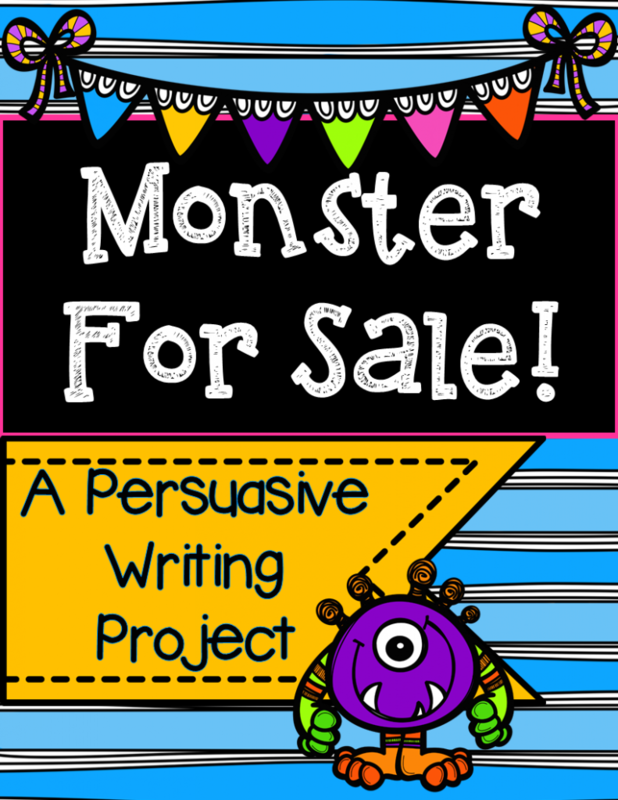 So, students would be persuasively writing to convince someone else to buy their monster creation. 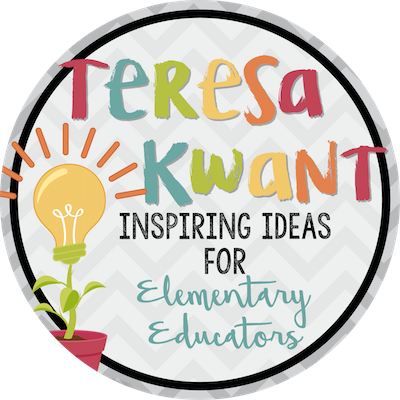 Check out this FREE product in my TPT store to do this lesson with your class today! Another way to get a little Halloween into the mix is to have students practice their descriptive writing and storytelling skills. Have students “carve” out a pumpkin and then write about the pumpkin’s story. Then students can describe the pumpkin’s physical features and why they have those features. For example, if you’re student makes a scary pumpkin, they should describe why the pumpkin chooses to sharpen its teeth and have squinty, evil eyes. From there, they can tell a story about the pumpkin and its life. This is a fun way to get students thinking about plot and characters. Another way to get your students’ storytelling juices flowing is by allowing them to write their very own ghost story! This is a great time to talk about characters, backstory, as well as a variety of plot elements. As a class, you can talk about what makes a good ghost story and challenge students to use as many of the elements you discussed within their story as they can. You can even have them make their story into an illustrated book that they could present to other students in your school or just in your classroom. Sometimes it can be very difficult to get students thinking about various ideas in a critical way. To help get your students thinking critically, try having them analyze what makes a good costume. Then, you can project different costumes and the students can give them a ranking and explain why they think that makes a good costume or not. Prior to showing them costumes, you can facilitate a group conversation about what makes a good costume so the students have a basis to go off of. Using games in your classroom is always a fun way to get students interested in a new unit or activity. Using those games to create stories makes their purpose so much greater. Have students go “bobbing for apples” by playing Apples to Apples in your classroom. Set a time limit for how long they will play. Then challenge students to write a story about a witch, a goblin, a ghost, a vampire, or any other Halloween spook using those adjectives. This helps teach them the importance of adjectives and how necessary they are to good writing! One of the best parts of Halloween is the candy. When your “candy drawer” is getting a little bit low, Halloween comes around just in time to load it up again. To incorporate writing into the best part of Halloween, you have several options. You can have students research why candy is given out to trick or treaters. Students may also do a class survey as to what is their favorite candy, and then write a short paragraph explaining their findings. They can also try to draw conclusions as to why this might be the best candy. The possibilities are really endless. From doing some light research to writing a poem about a piece of candy’s journey, the students can exercise their writing skills in a variety of ways. Writing is an incredibly important skill to have but it isn’t always our students’ favorite. Using fun times of year to add a little something extra to the task at hand can turn frowns into smiles. So this Halloween, try out a few new writing activities to get your students’ brains going and fingers typing!